La Bergerie Provençale si trova tra i borghi, vigneti e frutteti di rinomato parco nazionale del Luberon di Provenza. Originariamente una vecchia casa di pietra 'Bergerie' o pastori 200 anni, la proprietà è stato ampliato e rinnovato per creare una splendida e lussuosa villa all'interno di un ettaro di giardino privato recintato con una grande metri 6x12 piscina riscaldata. Avvicinato lungo un viale alberato, la casa si trova nella splendida campagna del Luberon ed è circondata su tutti i lati da vigneti, terreni agricoli e boschi con una splendida vista ininterrotta del villaggio di Roussillon, una delle acclamati 'Les più bei villaggi di Francia de France '. Situato nel cuore della valle del Luberon, la casa si trova a breve distanza in auto delle zone più famose collinari 'appollaiati' villaggi, mercati e ristoranti, tra cui Gordes, Menerbes, Lacoste, Bonnieux con il villaggio locale di Roussillon a soli 3 minuti di auto di distanza . La casa è stata progettata per essere una casa molto confortevole ed elegante lontano da casa. Ci sono quattro grandi camere da letto matrimoniali si aprono sulla terrazza ombreggiata con vista sulla piscina. Due delle camere sono dotate di bagno privato con vasca e doccia separate. Il terzo e quarto camere condividono un terzo bagno separato dotato di vasca e doccia. Tutte le camere sono dotate di aria condizionata per il vostro comfort. La cucina è ben attrezzata con lavastoviglie, frigorifero americano, forno e forno a microonde. Un ampio ripostiglio separato è dotata di lavatrice e stenditoio. La casa è naturalmente fresca d'estate e dispone di riscaldamento a pavimento e un grande camino nel soggiorno per i mesi più freddi. Il salone ha un grande televisore LCD e lettore DVD con una vasta gamma di canali satellitari, tra cui tutti i canali gratuiti del Regno Unito tra i canali per bambini. Gli ospiti sono invitati a utilizzare il dock audio compatibile con iPod e la connessione internet a banda larga wireless. Lenzuola, asciugamani e teli da piscina sono inclusi insieme ad un servizio di pulizia alla partenza. Fuori i giardini estendere a un ettaro contenente una miscela di prati, boschi di quercia e frutteto. Il sud riscaldata si affaccia 6x12m piscina è raggiungibile con tortuosi sentieri di pietra ed è circondata da un prato per prendere il sole. La piscina si accede da cancello di sicurezza ed è dotato delle più moderne copertura automatica per garantire la sicurezza della vostra famiglia. Sedie a sdraio sono forniti così come un metro 3x3 sontuoso fuori divano a L per il relax in piscina. Direttamente accanto alla terrazza della piscina è la cucina estiva all'aperto, questo è dotato di un grande barbecue. Un'altra zona pranzo esterna totalmente separato si trova in un boschetto di querce sotto pergola. We travelled with our two adult children and partners and three year old grandson. The accommodation meant we all had our own sleeping and bathroom space away from the living area. The garden was large, a mix of grass area and flowering bushes near the house and pool and wild spring flower areas beyond to the climbing frame. Yet all visible from the covered outdoor table and pool area so we could keep an eye on the exploring child. Thank you for providing the toys for him, much enjoyed. Facilities were excellent, and Christian a great manager. He was ready to fit with our timetable and quick to respond to a BBQ malfunction. Plenty of china and cutlery, good cooking facilities and a fully functional utility area with soaps and dishwasher tablets provided, plus spare towels and bed linen if needed. We were able to enjoy our walking from the house through spring flowers,and blossom on fruit tees, neat vineyards and lavender fields.The youngsters walked as far as the Tara vineyard. You do need a car. Within short drives were many good venues, markets, hilltop towns with history, views and good eateries. We visited the Villages Des Boiries and Senaques Abbey , both good value. We saw wild boar and deer in the garden, plus butterflies and many birds- red kite, buzzards, hoopoe amongst them. On our walks we also saw a snake catch a mouse,and large roman snails in romantic attachments . The weather was great so we did not light the indoor fire, and the only down side was that in mid April the pool was not really warm enough to swim - the young adult males braved it but the rest of us just cooled our feet and splashed. However Neil had warned us and still got the pool team in to attempt to get it warm. All agreed that we would like to visit again - if the family doesn’t expand too much to fit ! Simple, stylish and traditional décor in the house makes you feel at home immediately. Each bedroom has its own character, lovely ensuite bathrooms and comfy linen.. Cosy lounge, lovely sofa's and DVD's for when your 14yrold Netflix Junkie son needs some screen time, although with a pool and garden as lovely as La Bergerie's, even he didn't feel the need for three days straight! More than enough towels, crockery, cooking equipment etc...nice filter coffee machine and big fridge with water filter and ice dispenser to keep your Rosé chilled...Even a BBQ Nitwit like me managed a fine steak or two on the gas burner that sits out on the terrace...best holiday we've had in years. If only we could have turned down the volume of the Cicadas, Jeez! Thanks Neil and Mel..
Amazing house in a fantastic area! This was our first visit to Provence and we have to say we loved it! 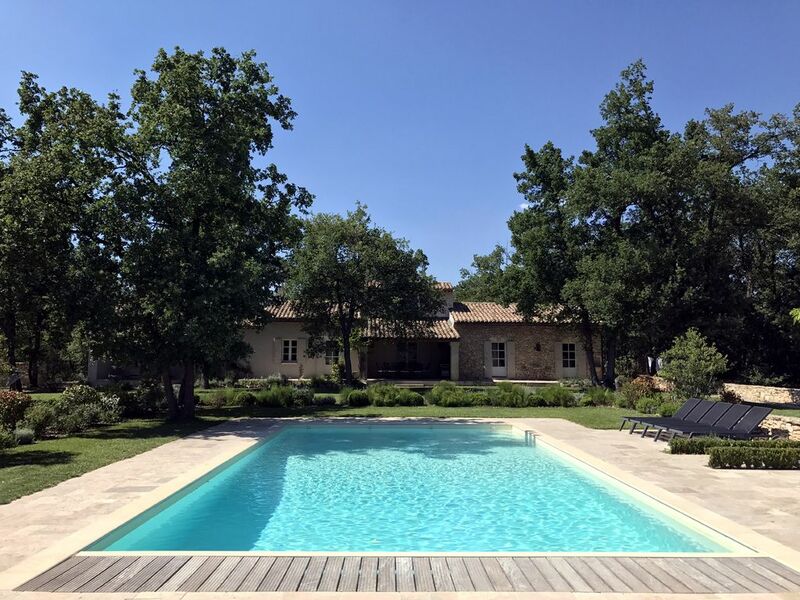 The house is perfectly located in the centre of the Luberon and we had trouble tearing ourselves away from the Pool each day to visit all the beautiful villages nearby. We travelled as a family with two small children and found the house absolutely perfect for our needs. The owners provided High Chairs and Cots and the Security Cover on the Pool meant we could sunbathe and read our books without having to watch the little ones every move. The house is located at the end of a very quiet private lane with no neighbours making it extremely quiet and private. Although we ate out regularly we found the kitchen and BBQ to be well equipped for the dinners and lunches we prepared ourselves. All the bedrooms are of a good size and the large Master Suite was a very pleasant surprise. We have already booked to stay again next year! Bob B.Where do you live? Allow mw to start this review by saying La Provencal Bergerie, Hameau Du Trabail, Roussillon is a lovely house with a beautiful, private pool and a spacious yard and that I would recommend it to almost everyone. If you're looking for a very comfortable house to crash at night, this is your place. However, and here's the rub, if your looking for something that feels like a home, a place where meals can be prepared and tables can be set this might not be the right place for you. Cons. Towels. We were provided with one bath towel per person. No wash clothes, hand towels or bath mats. And the big fail, at least for our group, were the wine glasses. Tiny 6 or 8 ounce wine glasses were all they had to offer. We poured over wines to bring home for dinner each evening and the wine glasses were just pathetic. Please take this review not as a condemnation of the property but instead our failing to find exactly what we were looking for. As I said. I would recommend the property to almost anyone. Bob, thank you for your review, we are glad that you enjoyed your stay. Each guest is supplied with one Bath Towel, One Pool Towel and a Hand Towel. We are not sure that guests would want to use face / wash cloths if we supplied them and in our experience this is the kind of personal item most people bring themselves. It is great that you were enjoying the local wines and apologies for the wine glasses being too small for you. These are very normal bistro glasses that are used all across France and they have the benefit of fitting in the dishwasher which I know is convenient for guests. I am afraid the best course of action may be to just keep refilling them regularly with those great local wines! in connection with the local area and any problems/difficultes. Our stay was a huge success and we found the villa to be delightful, as indeed was the surrounding area. I would not hesitate to repeat the experience and to recommend it to friends..
Il Roussillon si trova nel cuore del Triangolo d'oro del Luberon, formato dai borghi medievali di Gordes, Bonnieux, Lourmarin, Lacoste, Menerbes (descritti in "Year in Provence" di Peter Mayle) e Oppede-le-Vieux, tutti sono entro 10-20 minuti di auto. Il borgo medievale nasconde un pittoresco dedalo di strade e piazze, pieno di affascinanti ristoranti e gallerie d'arte. Se cammini verso la cima del villaggio vedrai meravigliose viste panoramiche sulla valle fino al Grand Luberon, alle pendici del Mont Ventoux e all'altopiano del Vaucluse. Il Luberon è considerato il cuore della Provenza e la casa è una base perfetta per esplorare Avignone, Aix en Provence, Orange e Arles, tutti raggiungibili in un'ora di auto. La spiaggia più vicina si trova a 1 ora di distanza a Cassis, che ha una spiaggia di sabbia fine appena fuori dal porto, la Plage de la Grande mer. La Costa Azzurra è a due ore di distanza. Si tratta di un'ora di auto per gli aeroporti internazionali di Marsiglia e Nimes. Anche il treno ad alta velocità TGV ferma ad Avignone a un'ora di distanza.